I think its been too long to write about everything, but some things stand out , special, spectacular happenings, wonderful experiences,so i will try to write about them ,together with pictures. 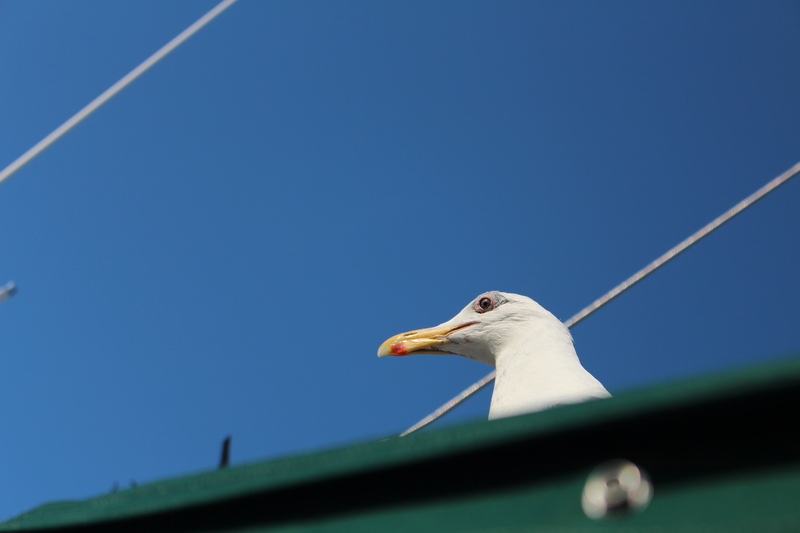 I stayed for 2 months in Port Sidney,on D dock, close to friends and other liveaboards, and yes, very close to Jonathan, most wonderful seagull, who, after a couple of hours, landed on the cockpit and let it be known very loudly that he found me again!!! Amazing bird, he had not seen the boat for 3 years, had not seen me for almost that long, and there he was, looking quite old actually, i have no idea of his age, but we have known him for 11 years now, he already had his adult feathers then, so that adds 3 years, but they get to be around 35 years old, and Jonathan’s eyes look old, he is also not so fast anymore, but still rules the whole marina, absolutely no other bird is allowed to come near the goodies that i give him. he came and sat on the deck, just looking at me, maybe wondering where Annie was, our cat, as they got along very well!!! He was there first thing in the morning, at lunch time, at dinner, and in the evening for a snack, sometimes he would sit with me and go to sleep for a while ,which makes me think that he is getting old for sure. November……no idea how that happened….time to write!!! I am going to start off telling you about two young people,both sailors, out there right now ,sailing South!!! 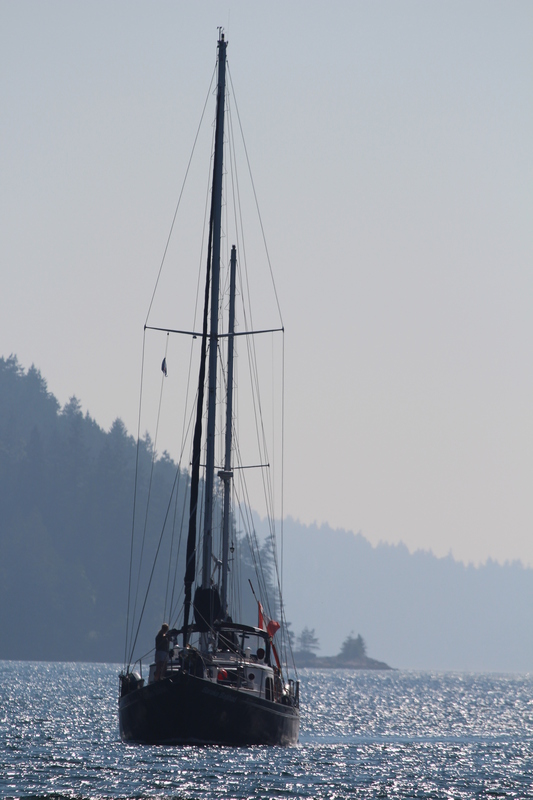 Their names are Jessie and Neil, and their boat’s name is ” The Red Thread” We met them last year, sailing around Vancouver Island, two wonderful,courageous ,young people ,living on board in Seattle and working towards sailing South. Well, they are doing that right now, sailing from San Francisco to Monterey,if you like, follow them on their blog: SVTHE RED THREAD.COM The blog is wonderful, full of great info about boating, about life, about sailing!!!! I admire them very much, and we hope to meet them again someday!! As for us……well, here we go!! I have had major issues with my new computer, and became very discouraged using it at all, while we were in Comox , we had a gent from the computer shop come to the boat ,to teach me how to use this darn thing, its not the computer itself, a beauty,ASUS X550D, but its Windows 8 ,which i absolutely hate, i had been using Windows XP for 9 years, just loved it, it was simple, easy,clear to use, i am not super smart but i got along very well with XP, and now Windows 8, i really started doubting my ability to learn anything new, what a frustration, this nice gent from the computer shop changed things as much as possible for me ,so its almost….ALMOST like XP, at least i am blogging again, so here we go with the stories i want to share!! !